If you are an enthusiastic gardener there is one job that you have no choice but to get down and do – that job is weeding! You would prefer not to have to do it. You would prefer spending more time with your cherished plants and flowers, but it is one job you cannot ignore if you want a healthy garden. According to the Shorter Oxford English Dictionary, a weed is – A herbaceous plant not valued for use or beauty, growing wild and rank, and regarded as cumbering the ground or hindering the growth of superior vegetation. eradicating quickly due to its invasive nature. Bare patches of soil can be overtaken very quickly by weeds, so if you have many gaps in your borders, try plugging the holes with plants. Weeds are so annoying – you think that you have removed them and then all of a sudden they suddenly spring back to life. Why is this? You may have just removed the top of the weed, but part of the root is still lying dormant. Once this gets sunlight and water, there is a good chance it will grow again. Weeds can grow on sparse lawns as the empty spaces provide a wonderful breeding ground. Seedlings can be brought to your lawn by birds or dispersed by winds. One very effective way of removing weeds is by simply using your hands. It involves some bending and hard work but it certainly is cheap. This technique requires you to make sure that the whole weed is removed and no root left behind. With shallow-rooted weeds, you simply need to make sure you hold the weed firmly by the stem and pull it out very gently. For weeds with much deeper roots, you may need to use a garden implement such as a hoe to loosen the soil around the root, so that the whole root can be removed. Any trace of root left behind and you run the risk of it regenerating. It is a very easy tool to use. The blade of the weed puller is placed next to the weed stem and pressed down. The blade moves into the soil to a certain depth and then tilted to bring the weed out. If you believe some of the root is still below the soil this process can be repeated. This tool is very good for removing dandelions from lawns. It is very lightweight and now has an added pedal for extra ease of use. The weed killer on the left, Roundup ( Glyphosate ), is a highly recommended weed killer. It is safe and is practically nontoxic to mammals. Once dry, it is harmless, so it is usually just a case of keeping pets away until the weeds have fully dried. Weed build-up can be prevented by using a thick layer of bark chippings, or leaf mould. This prevents weeds from growing and it will also help to preserve moisture in the soil. A weed preventer stops weeds from germinating. It will not kill existing weeds, but hopefully, the time spent laboriously pulling out weeds with garden tools will be kept to a minimum. Preen is an example of a good weed preventer. When plants are dry, this product is sprinkled on the soil surface. Once activated by watering, it forms a weed control barrier in the top 2 inches of soil, preventing weed seeds from germinating. Preen is an organic product made with 100 percent corn gluten and is safe to use around children and pets. Try to control the weeds on your lawn by using a lawn fertiliser. EverGreen complete 4-in-1 feeds your lawn whilst also working to kill weeds and control moss. It has a special WaterSmart formula to protect against heat, drought and other stresses. This product will make your lawn greener within the week. The moss will die and go black and need to be raked out after 2 weeks. Full weed control will take 3 to 5 weeks. This substance is applied to your lawn from April to September. Landscape fabric can be very helpful in drastically reducing weeds in certain areas of your garden. It simply acts as a barrier to weed growth. Weeds already in your soil cannot grow through the cloth so they simply die. There are many opinions on how effective this is, but personally, I have found it to be good in areas where gravel is to be laid. Weeds will then only grow on top of the gravel and as such their roots will be shallow and easy to remove. 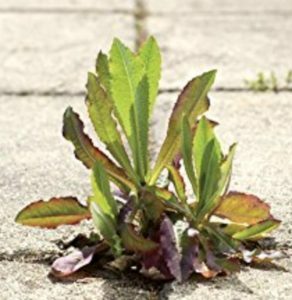 No matter how aware you are of any potential weed problems in your garden, no matter what preventative measures you take, there is no way you will stop them springing out of nowhere in the most unannounced of manners. Use weed preventers on your lawn and borders, be very vigilant with your weeding tools, try to keep on top of the menace and if all else fails, use a pet-safe weed killer. A holistic approach is what is required and hopefully, this will result in fewer beads of sweat on your brow.